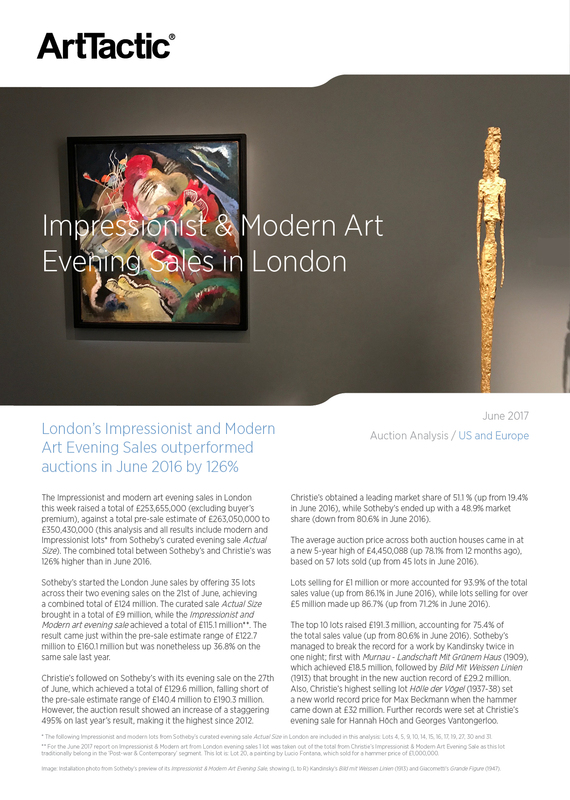 The Impressionist and modern art evening sales in London this week raised a total of £253,655,000 (excluding buyer’s premium), against a total pre-sale estimate of £263,050,000 to £350,430,000 (this analysis and all results include modern and Impressionist lots* from Sotheby’s curated evening sale Actual Size). The combined total between Sotheby’s and Christie’s was 126% higher than in June 2016. Sotheby’s started the London June sales by offering 35 lots across their two evening sales on the 21st of June, achieving a combined total of £124 million. The curated sale Actual Size brought in a total of £9 million, while the Impressionist and Modern art evening sale achieved a total of £115.1 million**. The result came just within the pre-sale estimate range of £122.7 million to £160.1 million but was nonetheless up 36.8% on the same sale last year. Christie’s followed on Sotheby’s with its evening sale on the 27th of June, which achieved a total of £129.6 million, falling short of the pre-sale estimate range of £140.4 million to £190.3 million. However, the auction result showed an increase of a staggering 495% on last year’s result, making it the highest since 2012. TOTAL SALES VS ESTIMATE (2012 – 2017). AVERAGE PRICES 2012 – 2017. HAMMER VS ESTIMATE RATIOS 2012 – 2017.